The Coalition to Save Manned Space Exploration: Mars by 1981 or 1995! The technological challenges in going to Mars are great, but not so great that we couldn't have gone there many times by now. Indeed, NASA's plans at the time of the Moon landing were to land on Mars in the early 1980's. And they well could have done so! Read a summary of Werner von Braun's 1969 plan to land on Mars in 1982--and a 50-person base by 1989! Politics, not technology, robbed us of our future in space. This time, we must not let politics rob us again of a bold, exciting future of space exploration; one which will help rebuild our economy and provide high-tech jobs and investments for decades to come. Any plan for reaching Mars by 2035 is a "mission to nowhere," and come 2035 the talk will be for a mission to Mars may be by 2069--a century from Apollo 11. Further, the US is not the only player in space, and the first to Mars and other destinations takes not just the credit for the accomplishment, but most importantly, takes the leadership in technology and thus job and economic growth for a generation or more. 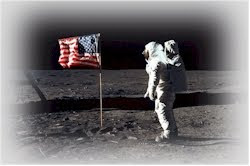 The Moon mission secured America's place as the undisputed technological leader in the world--let's not surrender and become the follower; a nation thus declining in wealth to second-rate status. I urge you to read the linked article about the "Is nuclear propulsion really necessary/Mars in 1995" study. It describes a 1980-1981 plan by Dr. B. C. Parkinson to land on Mars and even to swing by Venus on the return trip to reduce return time. Yes, we could have gone to Mars in 1995, using largely existing technology and hardware circa 1980. We could do an even better job of it today; and in less time too. That was a bold and innovative plan in 1980, particularly using the Venus return--risky without superior radiation shielding. Given three decades of advances since, it should be considered a mild plan today. This, however is exactly the sort of research we need to use today to create an even better Mars expedition in even less time--and to show sceptics who say it can't be done for decades. There have been decades of research on how to design Mars and other deep-space missions, and much is completely applicable to today. The basic requirements for the mission haven't changed since Werner von Braun's first plans, and orbital mechanics hasn't changed either. Advances in technology only make the job easier. Compiling and publishing such data for Members of Congress and other decision makers could assist in the goal; let's not waste this collective knowledge. No need to spend years re-inventing the wheel, but to just add in later advances to existing workable technology and science, and to do it. Manned mission to Mars in 2019, A Proposal for the Augustine Commission July 27, 2009 by Henri Tapani Heinonen. The author specifically addresses the folly of waiting until the 2030's. Three Shuttles To Mars by Michael J. Coppi. Why just retire them to museums? This 2009 plan sends out our three space shuttles on the Mars trip, including one which would end up landed on Mars. While impractical due to it's risks, it is mentioned here because it shows the many possible ways to Mars--and the incredible but untapped capabilities of the Shuttles. Not mentioned in this plan is the fact that the shuttles in theory might have at any time been used to go to the Moon, with a lander in the payload bay and by attaching a suitable external fuel tank at the ISS. Ever get the idea that human missions to Mars have been "studied to death," and that it's time to "just do it?" Please forward to us any research papers and plans you may be aware of so we may include them in research compilations for members of Congress, the media and others. Who has copies of detailed plans from NASA's Apollo-era Mars mission and or other plans/studies/diagrams/blueprints for manned space exploration, space industrialization? Simply, it is not true that we must wait until 2035 or later to reach Mars. Nuclear, ion or other technologies will eventually shorten the travel time to weeks--such would be valuable and would be used at the start or as soon as practical; but if not practical for the first missions, that should not dictate delays or it will not ever happen. Let not the perfect be the enemy of the good. The explorers of the 15th and 16th centuries did not wait for steamships, GPS navigation or Boeing 747s to explore the world. No; they went in spite of the many risks, long voyages and great hardships, and we too should boldly explore space--now!